The Hist are a species of giant spore trees growing in the innermost swamps of Black Marsh. 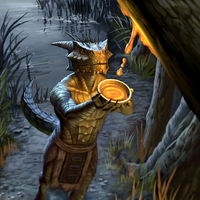 Argonians are known to have deep connections with the Hist, calling themselves "people of the root", and licking the leaking sap of their trunks in religious rites. Others claim the trees are, in fact, a sentient race, more ancient than all the races of man and mer. The Hist trees of Black Marsh, most say, were the original life forms on Tamriel. The Hist were considered bystanders of the war between the Ehlnofey, but most of their realm was destroyed as the war passed over it. It is believed that the Hist acknowledge Sithis' role as the "Original Creator". It is said that all Hist are connected at the root—they speak to each other and to the An-Xileel (though some trees, like the city tree of Lilmoth in the early Fourth Era, may become isolated). In the Third Era, the Hist used their influence to call Argonians from across the Empire back to Black Marsh. Having foreseen the Oblivion Crisis, the Hist (through the An-Xileel) ordered the Argonians to assault the invading Daedra. The Argonians poured into the Oblivion Gates with such ferocity that Dagon's lieutenants had to close them. This resulted in an astounding victory for the Argonians and led to the collapse of the Empire in Black Marsh as the Argonians turned to the An-Xileel. A distinct group of the sentient trees were found on Umbriel. Like that floating island, they originated from a mysterious realm of Oblivion and came to inhabit the realm of Clavicus Vile. In the early Fourth Era, these Hist were split from the realm by Umbra, becoming an integral part of the life cycle on the floating island of Umbriel. Compared to the Hist of Tamriel, these trees slightly differed in appearance; the leaves were too oblate, the bark less fretted, and the smell a bit off. The Hist of Umbriel were responsible for producing many substances used in the island's kitchens. The trees were interconnected and played an important role in the recycling of souls on Umbriel; in one sense, they were Umbriel. They lived in the Fringe Gyre, an external area of Umbriel located around the edge of the island's surface, although their root system extended down into the lower subterranean levels of the island. They were thought to be drawn to Tamriel from the Void in 4E 40 by the Hist. Annaïg Hoïnart, a Breton who had infiltrated Umbriel and assimilated into the kitchen staff, planned to feed the roots of the Um-Hist poison and cripple Umbriel. Mere-Glim, Annaïg's Argonian companion, felt a connection with the Um-Hist similar to that of the Hist, albeit quieter and vague. After he was reborn as an Umbrielian, Glim felt an even deeper connection, and foiled Annaïg's plot. Following the destruction of the second ingenium, the Um-Hist were responsible with teleporting the island of Umbriel to their mysterious realm. Following the death or departure of many Umbriellians from the grounded island, it is unknown how the Um-Hist adapted to their new environment. The Sleeping Tree is a strange leafless tree found in Whiterun Hold in Skyrim. It grows in a misty pool beside a small cave now named after the tree. A giant encampment also named for the tree surrounds it. Several legends exist on the origins of the Tree. Some say that a piece of rock was blasted from Red Mountain during the Red Year and landed in Skyrim, and the Tree grew from the resulting crater. Others say that it grew from a spore which fell from a "floating island", referring to Umbriel, in which case the Tree is one of the Hist of Umbriel. The first edition of the Pocket Guide to the Empire mentions the Hist, though its description of them differs dramatically from that given by other sources. They are described as a relatively intelligent strain of Argonian; repulsive, but peaceful enough to be tolerated outside of Black Marsh. The Pocket Guide also makes reference to their "cherished spore-trees". This page was last modified on 4 April 2019, at 20:53.